Doors that slide in panels from a vertical position when closed to an overhead position when open. 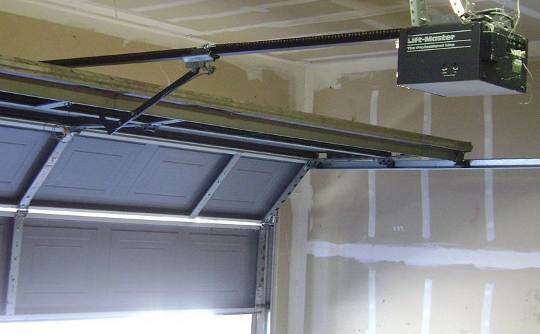 A quite wide garage door that is made in panels about 450 or 18" wide. This type of door is mounted inside channel tracks at the sides, similar to roller doors. The side tracks change from vertical to horizontal by following a quadrant or quarter circle of about 450 or 18" radius. Now this is a far more instructive shot. We can see that the panels are quite light weight being of sheet metal clad over light box section frames. A simple and cost effective method of construction. The side rails turn a corner and are suspended from the ceiling. 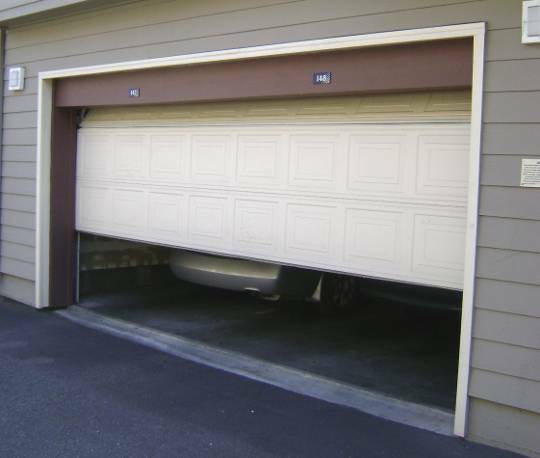 Note that the automatic opener with it's track sits above the door, so that the garage needs sufficient extra height to accommodate this type of system. Photos on this page thanks to Wikimedia Commons.